An almost native of the beautiful mountain community of Gunnison, Colorado, artisan Martha Parsons created Parsonage Jewelry to satisfy her creative muse following a long and fulfilling career as an educator working all over the world. Creative arts result from a wide range of influences and experiences, as is evident in the work of this jewelry designer. The daughter of an artist/scientist mother and artist/educator father, her interest in the arts and the broader world developed when Martha was a child, as the family lived in France and Germany. That interest continued to deepen and broaden when Martha pursued a career in overseas education. As a long time teacher, principal, and staff developer, she has lived and worked across Europe and in the Far East. Years of observing and absorbing artistic and cultural influences while working in Germany, Turkey, Korea, Newfoundland, as well as many years in England and Italy have all contributed to Martha’s innovative approach to the creative arts. However, global influences on her work are not confined to places she has lived; they include adventures and experiences gained from travels and explorations to places like Africa-- as well as the American West, where it all began. A keen interest in antiques and the hunt for all things unique and interesting developed over time-- all influences that can be seen in her work. 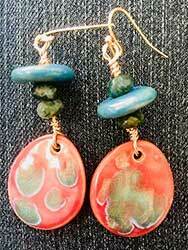 Martha creates pieces of jewelry in a style sometimes whimsical, sometime classical, sometimes ethnic-- always unique. 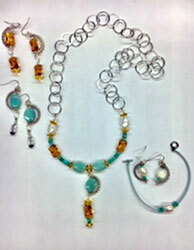 Her jewelry incorporates mixed media and mixed metals. In any one piece, you might find semi-precious gemstones, leather, fabric, glass, metal, porcelain or pottery, acrylic, and/or clay. And sometimes, even collectible bits of jewelry are mixed in, creating totally exclusive pieces. While there may be variations on a theme, all Parsonage Jewelry pieces are one-of-a kind. Martha has stated, “As a lifelong educator and student, I constantly learn new techniques, materials, and methods which means my style evolves continuously. 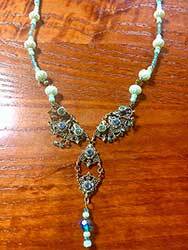 For those who love to purchase and wear distinctive jewelry, you will always find something original from Parsonage.